E-gold is a better option for investors than gold ETFs. A small extra return can have a huge impact on your savings over the years. The debate about physical gold versus gold exchange-traded funds, or ETFs, was settled in favour of the latter a long time ago. Now, e-gold, another product that gives exposure to the gold market, is laying claim to the crown. E-gold, an electronic way to buy the yellow metal , gives better returns than gold ETFs. 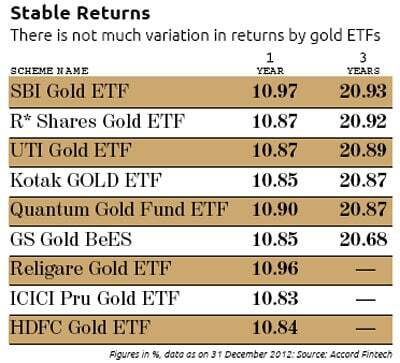 In 2012, it returned over 16 per cent compared to the 11 per cent average return given by gold ETFs. In 2011, e-gold and gold ETFs had returned 32 per cent and 31 per cent, respectively. Experts say e-gold will always beat gold ETFs in returns as the latter's net asset value, or NAV, is computed after deducting the fee of the asset management company plus storage and custodian charges, which vary from fund to fund. The cost of trading e-gold in the spot market is nominal. "The advantage of buying egold is cost effectiveness. In e-gold, there are no recurring expenses such as management fee. This reduces the cost and increases returns year-on-year. Thus, e-gold is more effective in the long term," says Anil Rego, founder and chief executive officer, Right Horizons. E-gold is held electronically in the demat form and can be freely converted into physical gold. In India, e-gold is offered by the National Spot Exchange Limited (NSEL), which gives investors the option to invest in commodities such as gold, silver and platinum online. Any investor can buy gold in small quantities on the NSEL and sell it after making a profit. He also has the option of taking physical delivery of the metal. Another way of taking exposure to gold is gold ETFs, financial instruments that track the price of gold. "Gold ETFs are the same as mutual fund units where each unit is equivalent to one gram gold, though some funds give the option to invest in lower denominations of 0.5 gram as well. Gold ETFs can be bought and sold like mutual fund units through the demat account via a depository," says Naveen Mathur, associate director, commodities and currencies, Angel Broking. While a few ETFs give the option of taking physical delivery and some don't, investors in e-gold can take delivery anytime they want. "Conversion of gold ETFs into physical gold is possible only after it exceeds a certain size. This can vary from 500gm to 1kg depending upon the fund house," says K Sandeep Nayak, executive director and chief executive officer, Centrum Broking. In gold ETFs, investors track NAVs, which keep changing with gold prices. In e-gold, investors directly track the price of gold. Brokerage: Trading in both gold ETFs and e-gold involves payment of a brokerage fee. For e-gold, it is 0.25 per cent of the purchase rate. The transaction fee for gold ETFs is Rs 1 per lakh compared to Rs 3.5 per lakh for equities, says Rego of Right Horizons. Taxation: Gold ETFs have an edge over e-gold here. For gold ETFs, one year is considered as the long term; it is three years for e-gold. Also, egold attracts wealth tax. "E-gold is treated like physical gold and qualifies for long-term capital gains benefits if held for three years or more. However, gold ETFs qualify for long-term capital gains treatment after being held for just one year. Gold ETFs are considered financial assets and hence are exempt from wealth tax, which is not the case with e-gold," says Nayak of Centrum Broking. Gains from gold ETFs, if sold within one year, are taxed according to the person's tax slab and at 20 per cent (after indexation) if sold after a year. Gains from e-gold, if it is sold within three years, are taxed according to the tax slab and at 20 per cent (after indexation) if sold after three years. Indexation is adjusting the purchase price with inflation. It leads to a higher purchase price and lowers the tax liability. For instance, if inflation is 6 per cent and the investment is Rs 1,000, the inflation-adjusted price for taxation will be Rs 1,060. This will lower the capital gains. Market Timings: You can trade egold till 11.30 pm, while gold ETFs are available in the market only till 3.30 pm.